to Helping You Get Results! I want to express my heartfelt gratitude for your help in my son Austin's case. I know that things could have turned out much much worse for him. You are truly a champion for those of lose causes. On behalf of myself and Mr. Bignoli I say Thank you for all you have done. - Joan and John B. You achieved a great result for my step-son Todd Lesiuski. I would like to thank you very much for a job well done. This letter serves as an expression of my gratitude for your support and assistance during my tenure in the C.C.D. Program Division 2, Gulfport, Mississippi. I now look forward to work under the capable leadership of Don Smith. I just wanted to tell you how much I appreciate your writing the letter a recommendation for me. Whether or not I am offered the position, it meant a lot to me that you took time out of your busy practice and life to write the letter. Many thanks for your yeoman service on Charles' behalf. It is always good to have a talented lawyer in your corner. Thank you for the way you handled this problem. The bill you sent is the most reasonable I have seen. I wanted to write you a note to let you know how much I appreciate the advice you gave me regarding the law suit pending for my car accident. I followed your advice and went to mediation and was able to settle. I also took your advice and asked my attorney to reduce his fees due to the fact that he did not have to take depositions, etc. He agreed, which is why I was able to settle. Because of your advice, I was able to make a more informed decision regarding what a good settlement offer would be. I am just thankful that it is behind me. Thanks again for your friendship and concern. I received certified copies of the two orders of dismissal and expunction, in addition to your transmittal letter to the Criminal Information Center. Thank you so much for your perfect success on behalf of Mr. Yoram. I could not have imagined a result better than what you were able to achieve, and just in time so these matters can't be used against him at his arraignment on an anticipated indictment in the next few weeks. I know Mr. Yeats is grateful. If I ever get down to your area (I'm told Biloxi is outstanding), I will certainly stop in to say hello. Jim, I know by your actions on my behalf I have been given a new lease on an old life. Words shall never express the depth of respect, nor the amount of gratitude I am overcome by at this moment. Thank you, Jim, for being one-of-a-kind!The only experience I have had with lawyers has not been good. 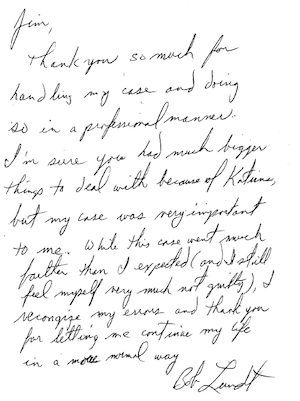 Thanks to you, Jim, I found a lawyer who really cares, listens, and works for the client. Bless you. 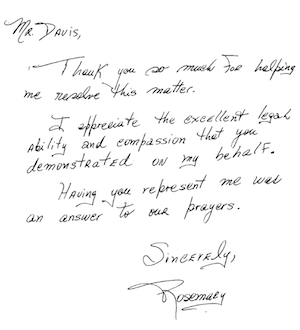 Mr. Davis, You are a great lawyer because you not only do the best you can for your clients, you also care about us. Once again, thank you, Mr. Davis, for everything!! !